The Missing Link In nature, animals consume foods that are whole, raw and fresh, while domestic animals generally have a diet of processed foods only. 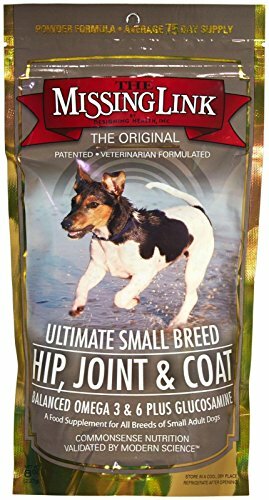 The Missing Link® Canine was developed to target the nutritional gap between what nature provides and what is available in commercial foods. Formulated with natural, quality whole foods and food concentrates, The Missing Link® Canine Blend reintroduces unprocessed, nutrient-rich foods into your animal's diet. This product is a dry granular powder, nitrogen flushed and vacuum-packed for freshness to protect its precious nutrients. It is a formulation for building and maintaining robust health in your canine/feline friend. We especially urge you to use it if your animal is sensitive to meat proteins. 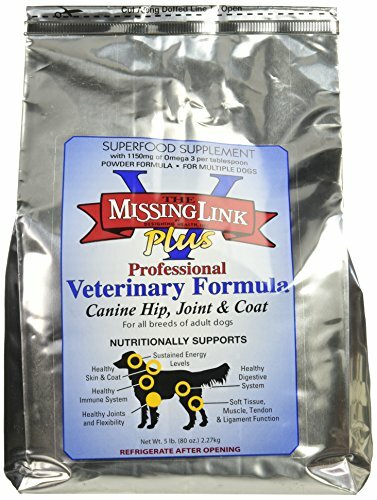 Veterinarians and pet owners have added The Missing Link® Canine Blend to commercial foods to support: Healthy Skin and Coat Sustained Energy Levels Healthy Digestive System Normal Weight Daily Dosages: Up to 20 lbs. : 1 teaspoon. 20 to 40 lbs. : 2 teaspoons. 40 to 80 lbs. : 3 teaspoons. 80 to 100 lbs. : 4 teaspoons. Over 100 lbs. : 6 teaspoons. Feeding Instructions: Add The Missing Link® to your animal's regular food according to its weight. As with any high fiber product, start with small amounts and gradually increase to the recommended level over the course of a week or two. Some animals may benefit even more if their Missing Link® intake is doubled for the first 90 days following the adjustment period. The daily intake can be divided into two or more servings if desired. Your animal will love the taste and you'll love the results! * REFRIGERATE AFTER OPENING. USE WITHIN 90 DAYS OF OPENING. The Missing Link products are formulated from whole foods and food concentrates to deliver nutrients that are bio-active, the way Mother Nature made them. 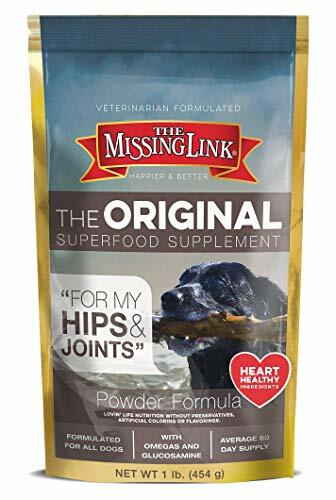 Missing Links proprietary, patented cold-processing method ensures the freshest delivery of precious omega 3 fatty acids in combination with a broad spectrum of natural fiber, flax lignans and phyto (plant) nutrients. We use ingredients that are nutrient rich to address the problems of marginal or empty calories and "missing" nutrients that often are characteristic of companion animal diets. These nutrients synergistically provide support to the digestive, nervous, and immune systems. The result is sustained energy, healthy skin and coat, and much more. NO FILLERS NO PRESERVATIVES NO ARTIFICIAL COLORINGS OR FLAVORS This unique synergistic blend of the highest quality ingredients combines: Balanced Omega 3 & 6 to maintain healthy skin & coat Omega fatty acids to support intercellular health, for absorption of fat soluble vitamins, and to maintain energy levels. Dietary fiber to promote a healthy digestive system. Phyto (plant) nutrients to support general health and nutrition. * REFRIGERATE AFTER OPENING. USE WITHIN 90 DAYS OF OPENING. Food Additives, It's no secret. Good health starts from within! Missing Link's proprietary, patented cold-processing method ensures the freshest delivery of precious omega 3 fatty acids in combination with a broad spectrum of natural fiber, flax lignans and phyto (plant) nutrients. The ingredients are nutrient rich to address the problems of marginal or empty calories and "missing" nutrients that often are characteristic of companion-animal diets. These nutrients synergistically provide support to the digestive, nervous, and immune systems. The result is sustained energy, healthy skin and coat, and much more. Food Additives, It's no secret. Good health starts from within! Missing Link's proprietary, patented cold-processing method ensures the freshest delivery of precious omega 3 fatty acids in combination with a broad spectrum of natural fiber, flax lignans and phyto (plant) nutrients. The ingredients are nutrient rich to address the problems of marginal or empty calories and "missing" nutrients that often are characteristic of companion-animal diets. These nutrients synergistically provide support to the digestive, nervous, and immune systems. The result is sustained energy, healthy skin and coat, and much more. .